OLD HOUSE HOMESTEAD: A New Gooseberry Patch Cookbook! A New Gooseberry Patch Cookbook! I have a recipe that will be published in a new Gooseberry Patch cookbook in the new year. So be on the lookout for a review and a giveaway then! 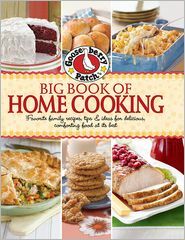 But for now, the kind folks at Gooseberry Patch have asked me to do an early-bird review of a cookbook coming out later next month. I was so excited yesterday when my review copy came in the mail! I am also excited because they included a copy for me to giveaway as well! What's more is that this hard cover cookbook is over 300 pages and filled with lots of yummy recipes and pictures to go with them! I spent some time yesterday pouring over the cookbook so I could pick out some to share with you. Now all I have to do is narrow down my list to 3 (or more) recipes to share with you. Not an easy task, I assure you! Be on the look out for some yummy recipes, a few pictures to go with them, and a fun giveaway in September! That is so exciting, I just checked out one of the books from the library and I can't wait to try some of the recipes. Congrats! !